I had been feeling a little under the weather last week, and I kept laying low, giving my body what it was asking for, and using affirmations (such as this awesome one my sister shared with me which I slightly modified: "I love my body and my body loves me, I am happy, healthy and free, and it is safe to be me") to keep myself well. Then my partner got sick and there was no escaping it. My already compromised immune system lost that battle, and much of this week has been spent in bed. When I wasn't in bed, it was showing up for clients only via phone with a couple of in-office exceptions. 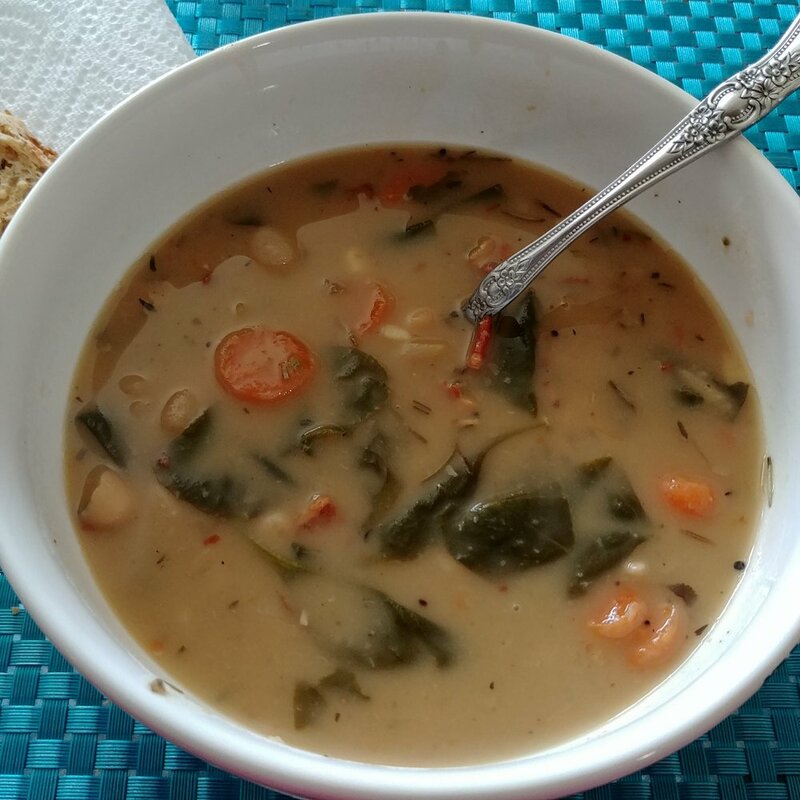 So, rather than sharing about my evening routine with you, I decided it would be fun to share what I've been doing to heal my body, including sharing a recipe for a super yummy soup I made this week. Practicing what I preach with my loving self care routine this week has looked like asking clients to do phone sessions if at all possible, allowing me the flexibility to work in my fuzzy robe and jammies with my unlimited supply of tea. And even prior to that, it looked like allowing my body to wake up whenever it needed to, without going into judgment about it or whatever else I had on my list to focus on this week. The focus of the week became healing myself and my body and allowing myself to do so free from judgment. I also cancelled pretty much anything that wasn't either directly income generating, or related to my healing. That meant I missed out on some stuff, and that's okay. As I mentioned, the top priority this week became, healing my body. Next up, lots of tea and fluids. I'm always a fan of Yogi Teas, and my favorite ones when I am moving a cold through my body are the Yogi Cold Season Tea and Ginger Tea. I tend to avoid sugar, although this week I allowed my body fresh squeezed orange juice in small amounts and I think that helped too. After tea and fluids was eating super nurturing foods that my body was asking for. This meant simple, easy to chew and digest foods. I always do kitchari weekly (kitchari is an Ayurvedic dish using mung beans and rice to help cleanse the system and keep you balanced) and this week in addition to kitchari, my body asked for bean soup. That's the recipe I'll share with you below! And finally, lots and lots of time spent inwards with myself, getting to bed on time, allowing myself lots of rest, and again, making my top focus healing my body. Oh, and those awesome affirmations! So there you have it, that is how I have been practicing what I preach this week. And, I truly feel like it has been working and I feel I am definitely on the mend. Yay! One final thing I want to share with you is a request: Please send me some healing light and love energy! I am open to receive it! Please and thank you! Disclaimer: When it comes to throwing things in a pot, I don't really measure, I eyeball, so when you read this recipe, you'll find my measurements come in "pinches, dashes, and splashes..."
1. Add coconut oil to pot on medium heat and let it warm up. 2. Add diced bacon and saute until it's done. 3. Once bacon looks done, add in onion and garlic and saute until fragrant. 4. Add in all remaining ingredients, add some water, and simmer on medium heat for about 10-15 minutes until it looks done. I usually avoid bread, but my body asked for some with this nice, hot, hearty soup, so I had some pieces of toasted gluten free baguette with it. It was so yum and I do believe helped in the healing process. Do you have a favorite recipe you use to help you heal your body? Leave me comment below with your favorite recipe or practices for healing.